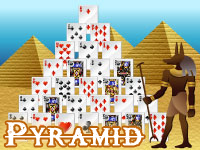 Pyramid Solitaire is a puzzle where you must remove all cards in pairs summing 13 points. Look carefully at the available cards in the pyramid before you start ! The goal is to remove all cards from the pyramid to the foundation (the 'done' pile at the top left) in pairs worth 13 points. For example, you can form a pair with a "ten" (10 points) and "three" (3 points), etc. ... The king can be taken alone, since it has a value of 13 points. To start the game, watch the bottom row of the pyramid, the free area (7 cards below the base of the pyramid) and the card turned over from stock (the pile of face down, unused cards) . If any two cards pair to 13 points (or any king is available) click and/or drag the cards together the card(s) will be moved to the foundation. If you can not make a pair, you must click again on the stock pile - the previous stock card is added to a pile called 'waste' .. the top card of waste is also available for pairing. You can click on stock as neccessary and work through the pile three times. cards in the pyramid can be moved if they are free (no card is placed above). free cards, waste and the stock can be paired together or with free cards in the pyramid. Analyze cards from the top of the pyramid, and detect those that will be hard to pair; build a plan to play them and focus on them during the rest of the game. Avoid using the free cards (from the bottom) when not useful, try to keep them for the end of the game and pair them for an additional bonus.